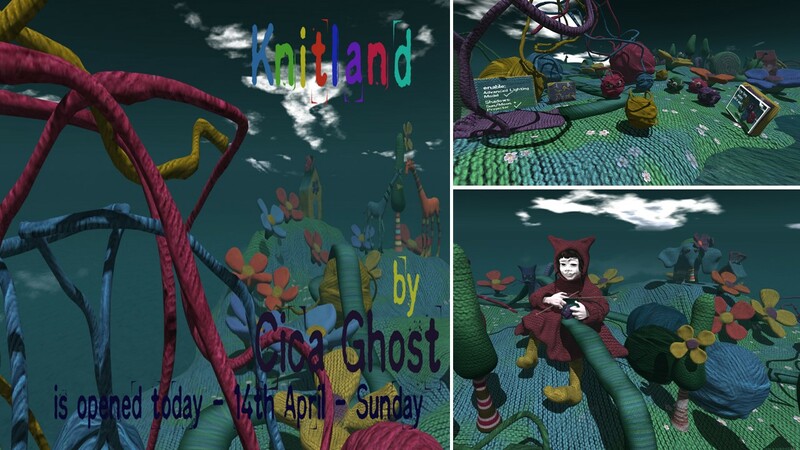 When I got inworld Sunday, April 14th, in the earlier afternoon, I found an invitation from Cica Ghost to visit her newest installation “Knitland” and I followed her invitation immediately. “Sometimes I get sad… but then I think about yarn and everything is fine 🙂” is Cica’s quote that accompanies this installation. At the landing point you get already an idea about the theme of Knitland. The ground is made of yarn, knitted of green and blue yarn and decorated with daisies. A board reminds you of setting your viewer to advanved light and to enable shadows. You can grab a yarny avatar in 5 different colours, I choose purple for myself. The yarny avatars have a Cica-like look with their big curios eyes. Using the yarny avatar adds to the expierience as no humans appear anymore in this world of yarn. 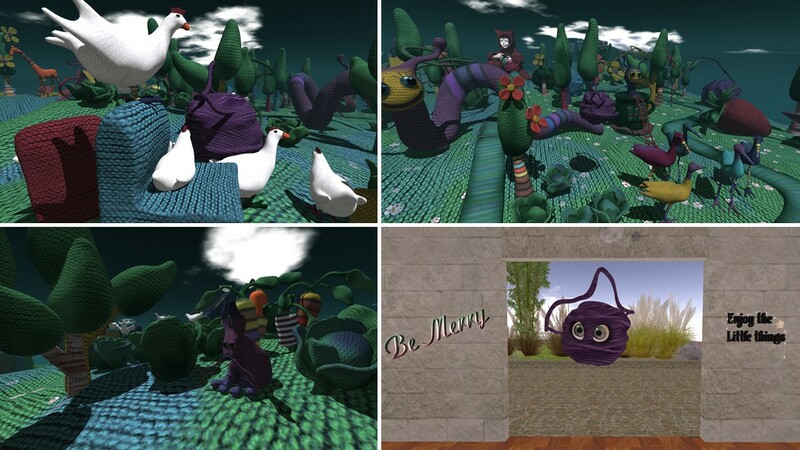 Already when I wore the yarny avatar I smiled diving into Cica’s world. 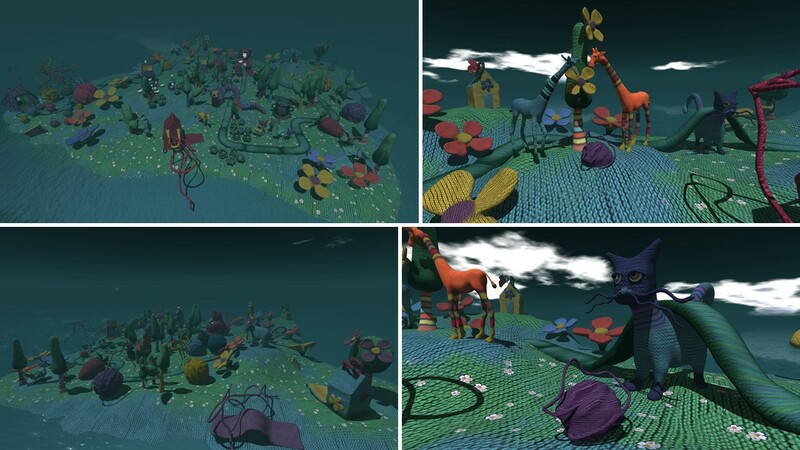 The yarny avatars are quite big, yet in Cica’s world they are still small in comparision with the environment. Time to explore Knitland! In the middle of the installation sits a huge girl – knitting of course. It seems as if she created all of this and goes on and on and on…. You’ll find many of Cica-ish animals at Knitland and they’re all made of yarn as well as all flowers, large and small, all trees and all little houses are made of yarn. I saw all kind of animals, a cat (of course), a giraffe, an elephant, a snake, some snails, chicken, a bunny, a donkey, flamingos to name just a few. But it is not just about knitted animals with Cica eyes, there’re also fruits and vegetables knitted like strawberries, carrots and cabbage. 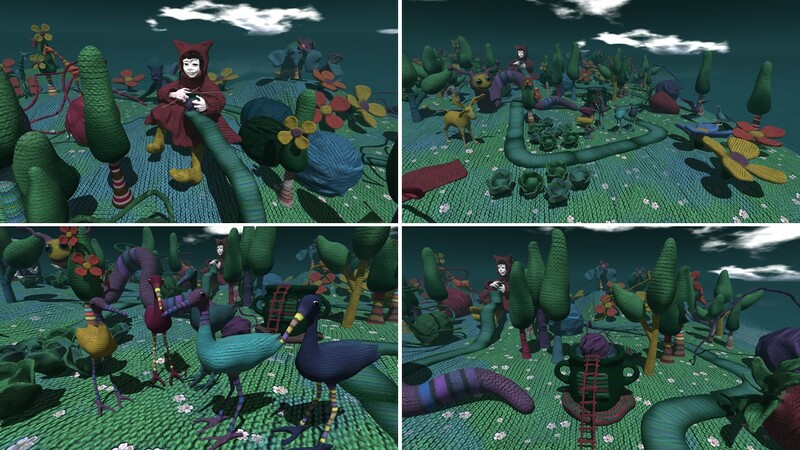 The girl is knitting a green paths that leads over the island, you can follow it or jump around anywhere else freely. I also discovered a mug with a ladder leading up to it. It was not that easy to steer my yarny avatar upwards and when I arrived a snail peeked out of the mug. I tried several times to initiate the snail to get out again, but I didn’t find out how. but later I saw the snail peeking out of the mug again. It was just a coincidence, the snail peeks out of her mug home when she wants to *winks*. Once again, Cica made my day. She conjured a smile on my face and I enjoyed diving into her knitted world. 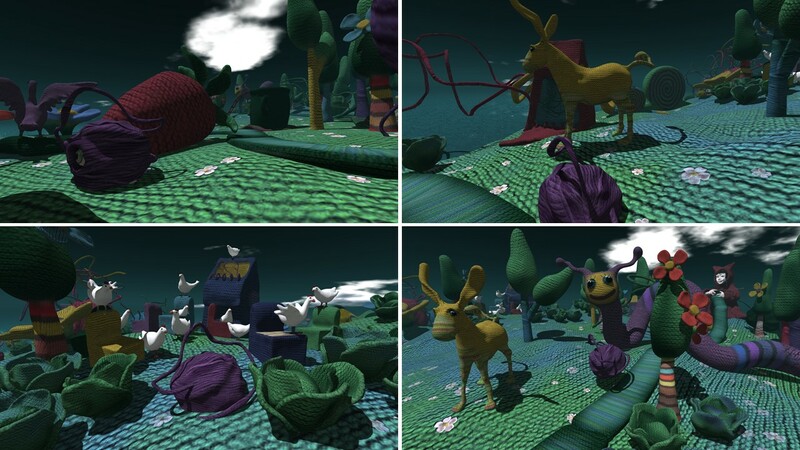 Knitland is another masterpiece from Cica Ghost. As usual you’ll never know how long this installation might be available. Go and see it yourself. Thank you a lot for making me smile, Cica! 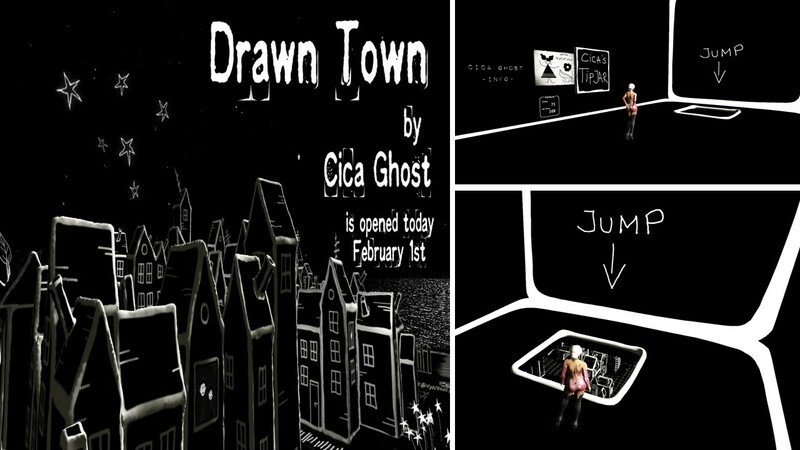 I got an invitation by Cica Ghost to visit her newest installation “Drawn Town“. This time Cica provided the quote “In the beginning it was all black and white.” by Maureen O’Hara to the visitors. 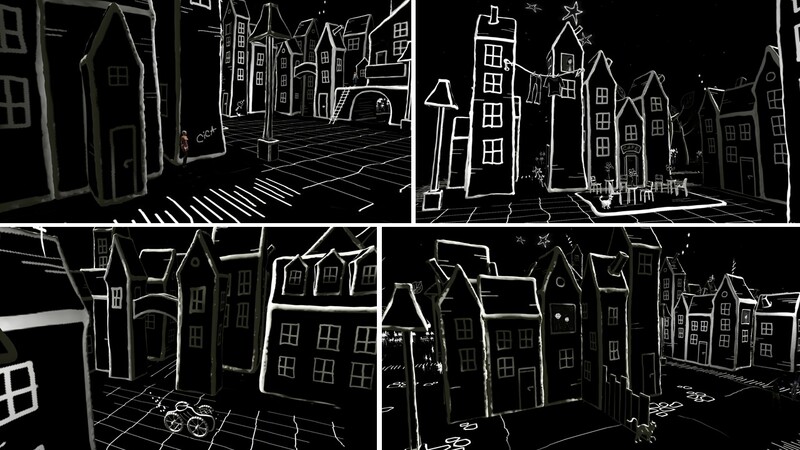 Drawn Town looks exactly as you would expect by the title – drawn, a town drawn with chalk on a blackboard …. in the beginning it was all black and white. The visitors are like blurs of colour on the blackboard as are some of “Cica-ish” people looking out from some of the window. The town is quite large and surrounded by fields of flowers which again have the “Cica-Style”. There’s once again a vehicle you can sit in and drive aroud with when exploring the town. The little details in Cica’s installations do make me smile always. For example the vehicle’s exhaust pipe produces little stars instead of smoke, as do the chimneys of the houses. There’s a larger court with a cafe in the center where you can sit and watch the visitors or cam around to discover the details of Drawn Town. 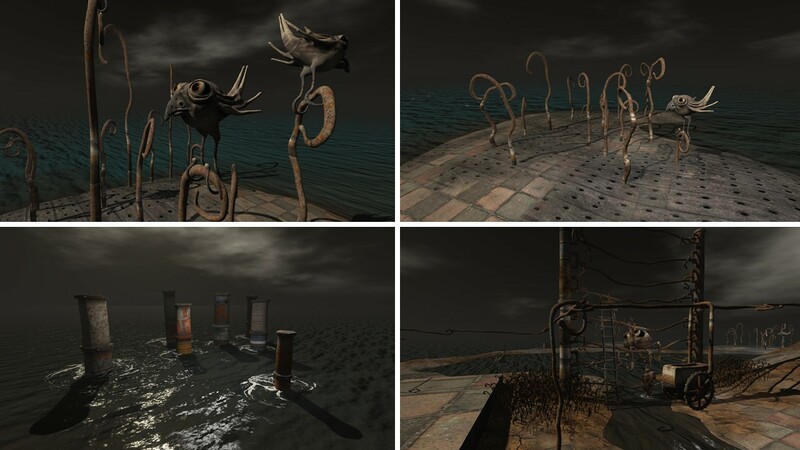 In Cica’s last installation Lullaby (read here) I missed a hidden cat. In Drawn Town there are many of them straying through the streets of on the rooftops of the town. 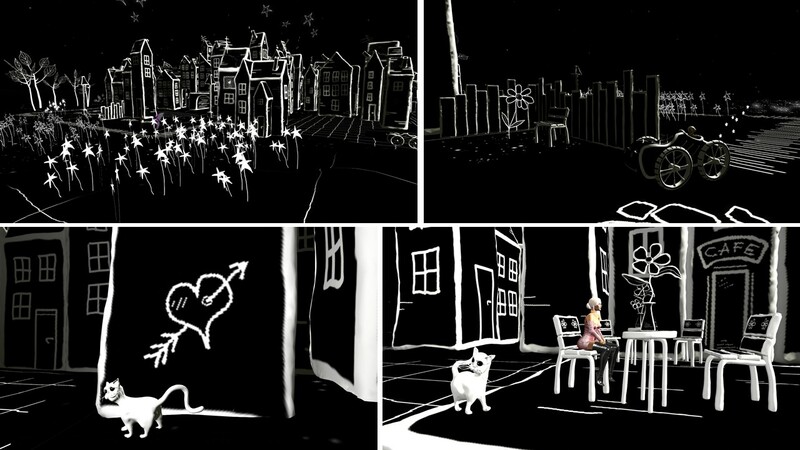 Although almost everything is in black and white Drawn Town conveyed Cica’s style to me already when I entered it. The landing is in a skybox with a whole through which you can see the town laying under you and you have to jump into the fun. As always I enjoyed my visit a lot and left Drawn Town with a smile. Thank you Cica! On Tuesday, December 11th, I got an invitation from Cica to see her newest installation “Lullaby” that opened that very day. Spontaneously I visited “Lullaby by Cica Ghost” right away. Lullaby is once again a meagre hilly island with some steep single rocks and rock arches which reminded me of Monument Valley in Utah, US. 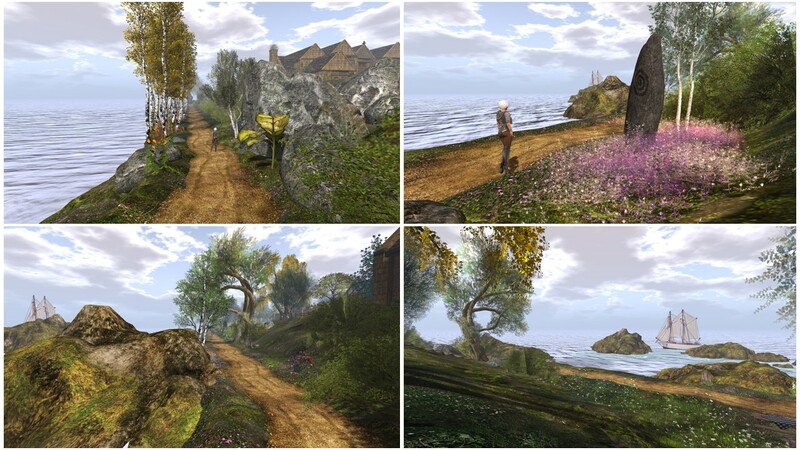 But when you keep the windlight setting, wich I did except for the overview zoom out picture, the rocks are not red but the whole scenery is in dark greeen and blue colours. 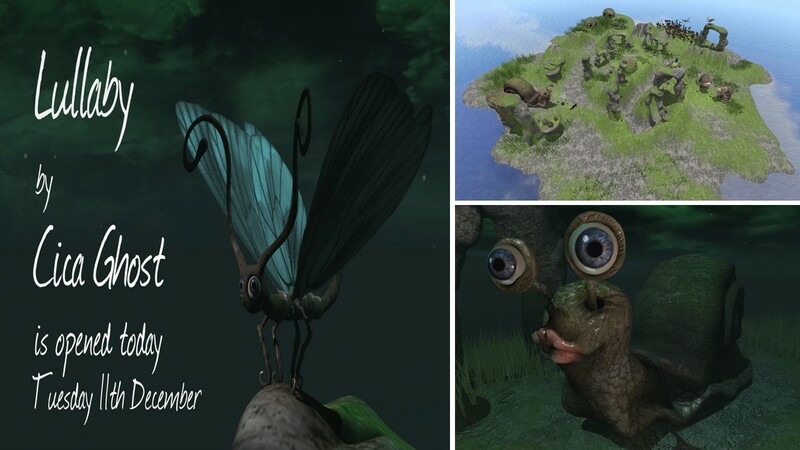 There’re again fantasy animals and bugs living at Lullaby. Some of them have similarities with real animals and bugs. Right next to the landing point is a huge snail with large telescope eyes. Bugs will fly around you during your visit. They are huge as well and they have a trunk, cute! If you’re not alone at Lullaby you might see other visitors flying around sitting on bugs. You can’t sit on the bugs flying around you, but you can get a bug to sit on and to fly around with on the top of one of the steep single rocks. You can keep the bug as a gift by the way and probably scare someone using it on other sims *winks*. Most of Cica’s animals at Lullaby are stationary, maybe a particular kind of worms. What you see is there heads and the big “Cica”-eyes. They are scary only on the first glance. After you’re settled in into the scenery, they look harmless and peaceful. One of them though opens it’s mouth, ready for eating you. No worries, the mouth is spacious enough and will open again, so that you can leave again. More animals? Yes! A large teddy bear, a butterfly and a spider. The spider can be found close to the arch with the house and nearby you’ll see the spider net. I had fun exploring Lullaby. Somehow Cica’s animals became friends of mine in the meanwhile. I look at them to see all details and am not scared. 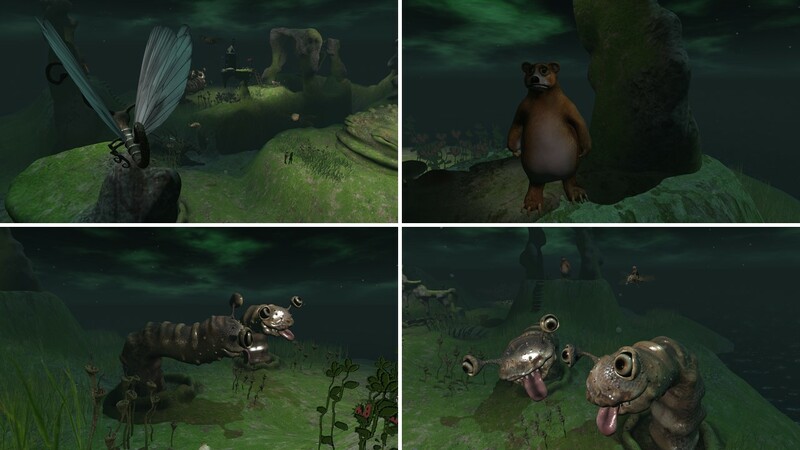 At Lullaby, the animals became part of the island. They’re integrated into the hilly landscape an into the steep single rocks. 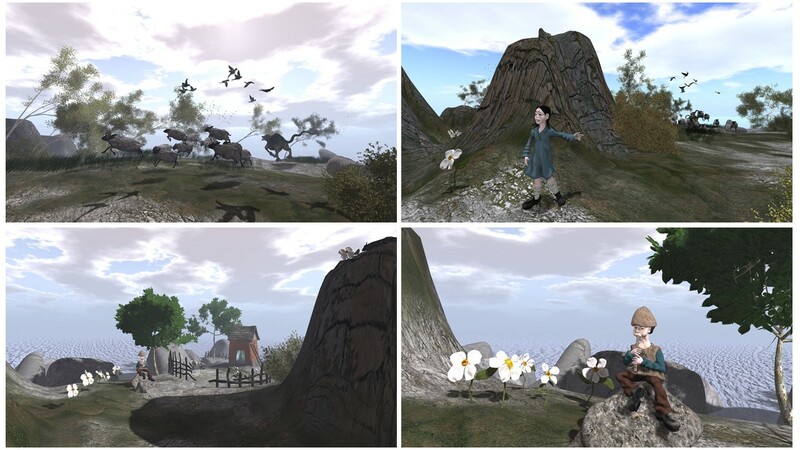 Lullaby is a fantasy world, a world to retreat and to let your mind wander. And the animals never sleep, even when they look asleep – insomniacs. I searched to find one of Cica’s cats hidden at Lullaby, but I didn’t find it. Cica Always hides one of her cats somewhere in her installations. Maybe the cat digged a hole and is hidding in it? Maybe the cat is even sleeping in the hole surrounded by a sleepless world of insomniacs? If you find the cat, let me know please. Thank you for another great installation, Cica. Once again, I enjoyed seeing your art a lot. 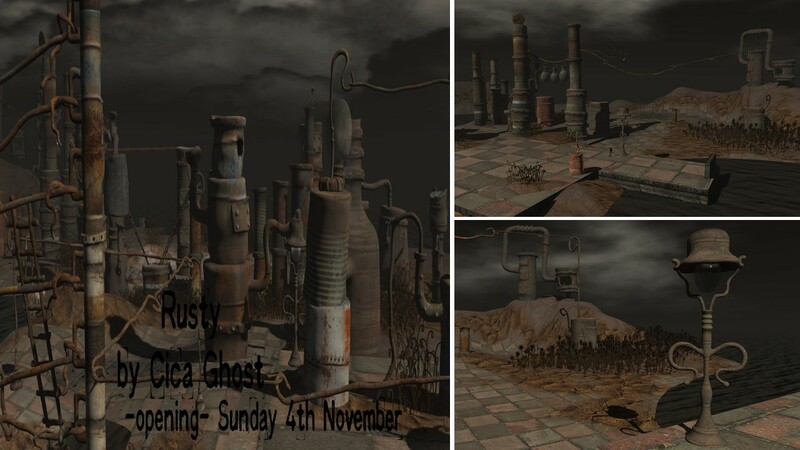 On Sunday, November 4th, I made a spontaneous simploring tour in the early evening and visited Cica Ghost’s newest Installation called Rusty, that opened that very day. As the name already gives away, Rusty is rusty. It’s an island with a surface seemingly made of an iron sheet with a chess board pattern and some fields are rusty. The island is covered with an old plant, and of course the single elements of that plant are rusty. There’re some areas covered with flowers, and these are .. rusty. From the very beginning of my visit I had fun at Rusty. I kept the windlight setting. It is dark and the sky looks a bit threatening but it fits perfect for Cica’s installation. Each and every element of the “plant” is different and often you find little living rooms inside at the top of them, accessable by ladders. Rusty birds have found their home at Rusty. And as it is Cica’s style these birds are comparably big and have big eyes that seemingly look at you. They sit on poles, on large rusty plants, on pipes and power lines. You can take a ride on several vehicles, which are extraordinary like a huge cat on wheels or a swimming mouse. 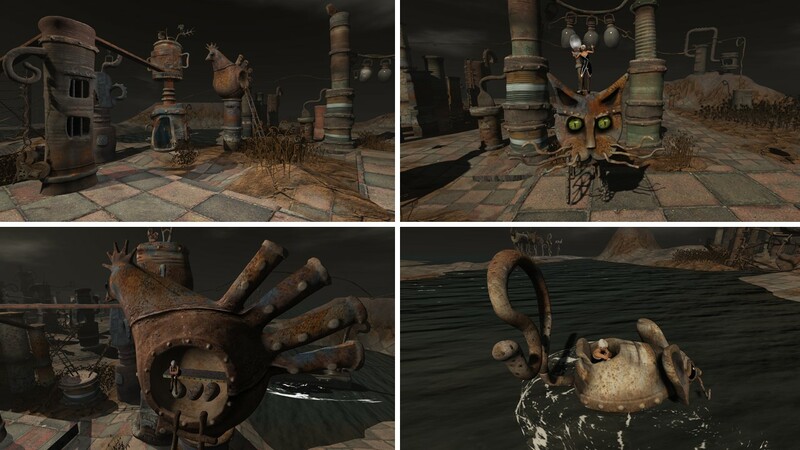 You can choose different poses and dance on the head of the huge cat while it drives around the plant. Like a cameo appearance Cica began to hide one or more of her famous cats in her newer installations. I found the cat also at Rusty and it conjured a smile in my face. Very funny is also that one of the plant elements is like a big chicken. You can climb up to it and sit “inside” over 3 eggs, that the chicken had layed. Cica added even more fun elements. On a platform that connects two of the living rooms at the top of the plant elements you can do a box fight. Cica provides the bozo gloves for the fight – and there’s another living room nearby with more chairs for the audience watching. A bit aside of the plant is a house that looks like the former energy supply of the plant or possibly the former control center of it. 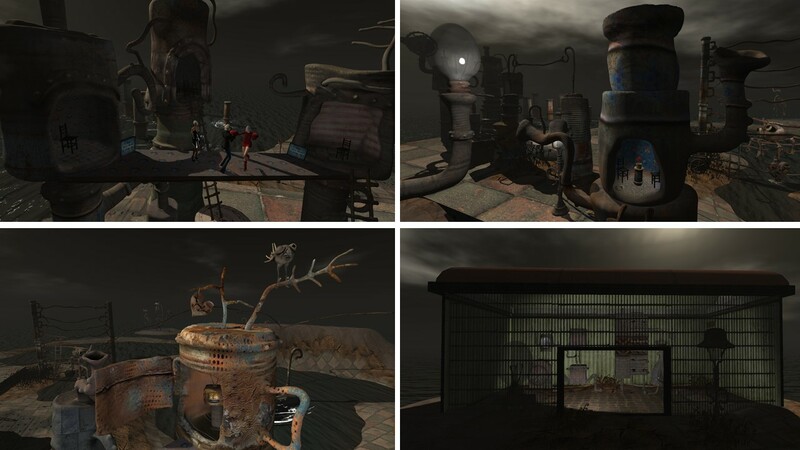 Actually, after exploring Rusty, it seems to me being more a little town rather a former plant side. At least it was transformed into a living place. Cica’s rusty birds and other animals found their place here as well as humans who installed their little living rooms and took over the place which looked so abandonned and rusty on the first glance. The longer you explore Rusty, the more details you discover. For example that some of the living rooms are colourful and stick out in this rusty environment. I’m pretty sure that I didn’t discover everything. This fits perfectly as visiting Rusty conjures a smile in your face and washes away your worries for the time you dive into Cica’s world and enjoy it. The “Boy Who Cried Wolf” is one of Aesop’s Fables. Aesop’s Fables, or the Aesopica, is a collection of fables credited to Aesop, a slave and storyteller believed to have lived in ancient Greece between 620 and 564 BCE. Of diverse origins, the stories associated with his name have descended to modern times through a number of sources and continue to be reinterpreted in different verbal registers and in popular as well as artistic media. 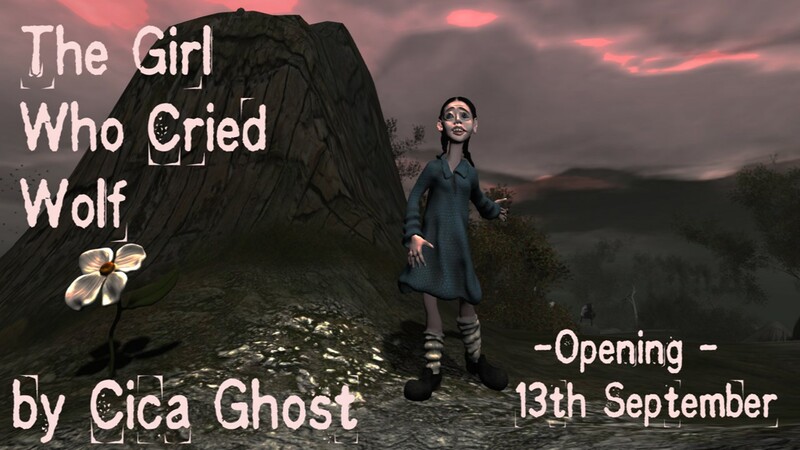 Before I visited “The Girl Who Cried Wolf” on Friday, September 14th, I read Inara Pey’s blog post “Cica’s The Girl Who Cried Wolf“, that was published on September 13th. Inara talked with Cica about her newest installation and Cica explained her ideas and thoughts behind it. 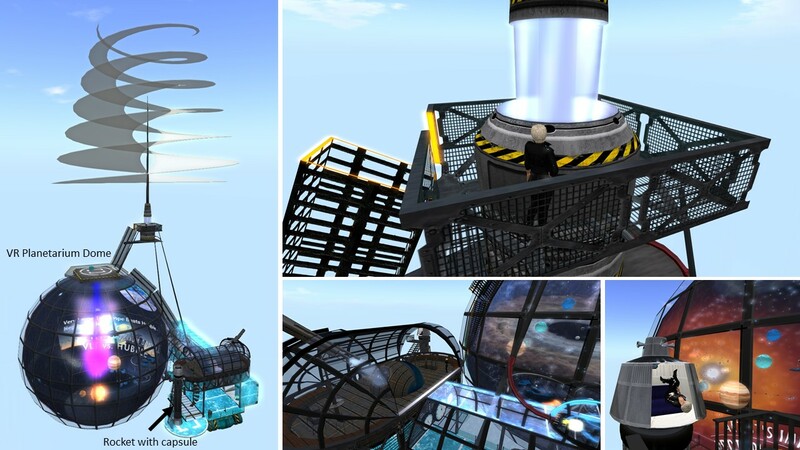 I recommend reading Inara’s post before visiting. My visit was short but very enjoyable. The installation is set on a rocky but not meagre island. When you walk from the landing point to the center of the island you first see the wolf hunting the sheep. A flock of birds is flying above the scene. The sheeps and the wolf are running that fast that they hoover above the ground. The only sheep that is safe from the wolf is significantly a black sheep on the top of one rock. Not far from this scene you find the girl who cried wolf. She looks scared and points to the sheep looking at a boy sitting on a rock and playing a flute. As opposed to the girl, he seems not to be impressed, nor willing to interfer. Just behind him is a little house with a garden, the village from the fable. Cica has developed her very own style and the girl and the boy look very “Cica-ish”. I wouldn’t have recognized the sheep and the wolf as her work at the first glance though. 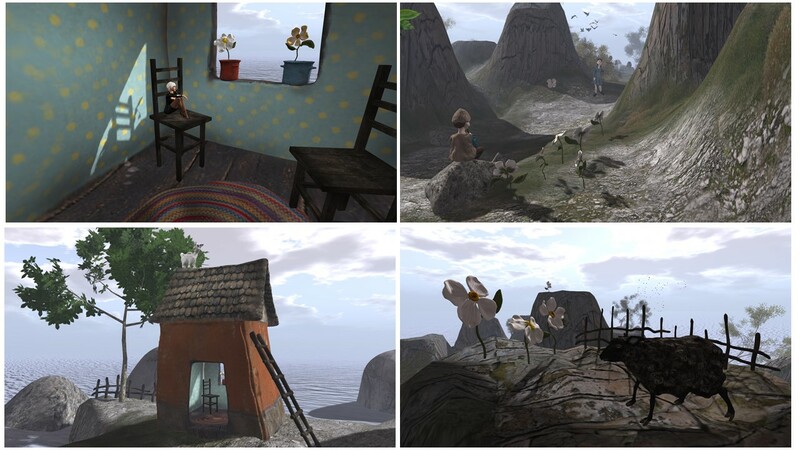 The flowers, that are spread over the sim, are those Cica already used in her installation Bees and Bears (read here) And you will find again one of Cica’s 50 cats (read here), it sits on the roof of the house. Like in many of her installations before humans are really short compared to everything else. This way you experience an other point of view, maybe more respectfully. As Inara mentioned in her blog entry, there are some possibilities to sit at “The Girl Who Cried Wolf“, try to sit on a chair in the house (although it might be difficlut to climb up *winks*) or just ride on a sheep or on the wolf (you can be the predator or the prey). On the top of some rocks you can also sit, yet instead of sitting you move, be it hopping or dancing, and it is fun! Thank you Cica for another nice installation, that made me smile once again. Today’s entry is a bit out of the more or less chronical order of our blog. The reason is that Cica Ghost opened her newest installation “Daydream” on August 10th. I got an invite from her and I visited Saturday, August 11th. As you never know how long Cica’s installations stay opened until she creates something new, I decided to publish my report timely, so that there’s enough time for you to visit yourself. Daydream is an island, but this time it is not meagre although there’re some hills and rock. You’ll find colourful trees and quite some lovely fields of flowers. 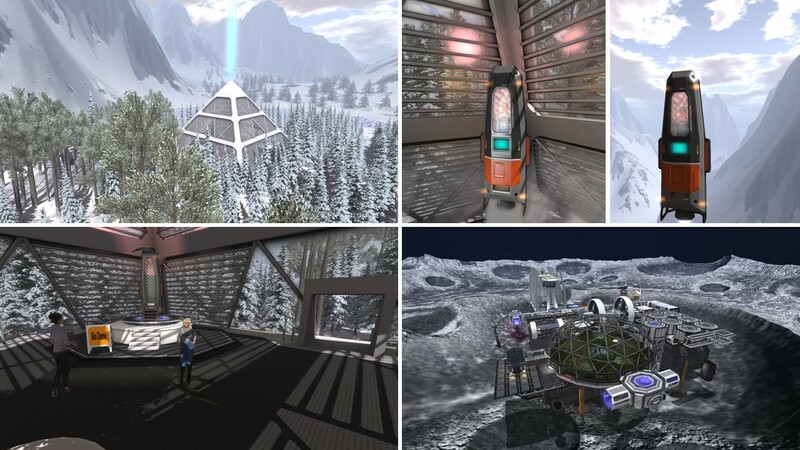 The landing is quite in the middle of the sim from where you can discover it on foot. I didn’t find any of the famous Cicamobiles this time. 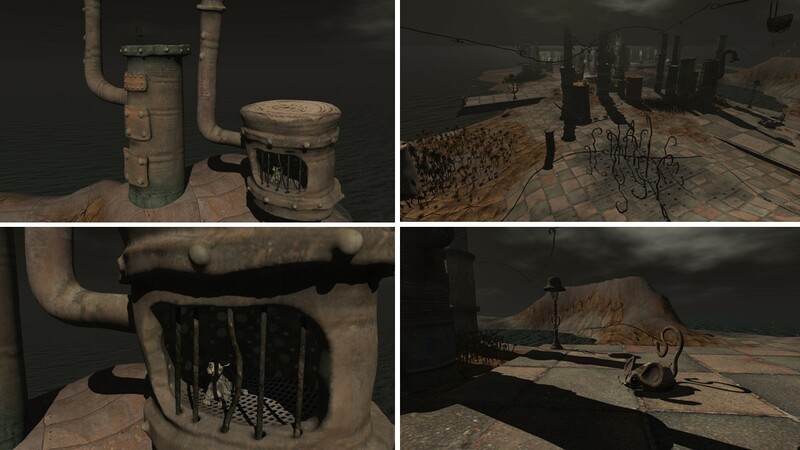 Daydream offers a broad spectrum of know and unknown characters and beings created by Cica nicely spread over the island and you encounter them on your way exploring it. Quite close to the landing are two snails in a field of flowers. They look at eachother and the scene is very peaceful. As always Cica’s beings are quite large. There are two turtles and they even don’t mind when you walk on their carapace. For me the two creatures, that look like big squirrels and eat strawberries, were really impressive and although they look like little dinosaurs there are not scary at all. There’s one being, I want to mention in particular, a crossbred of a goat and an eagle with an human face, sitting on a rock like supervising the whole island and the scenery. 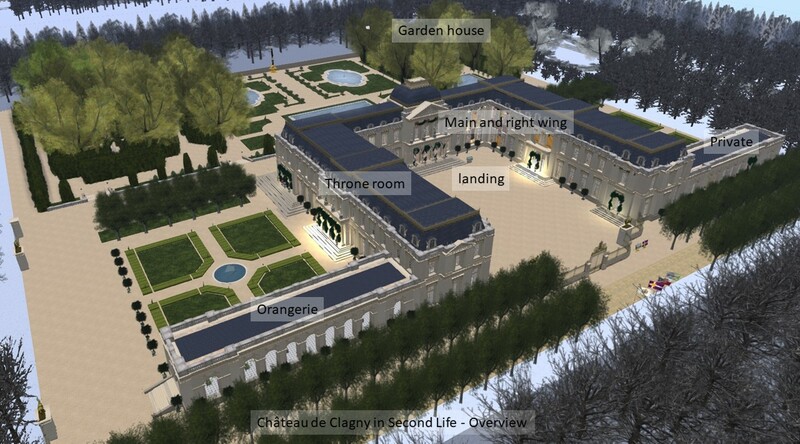 You can see it from the landing point and from other spots on the island. At Daydream you will find a few places to sit and even to cuddle. One of these plaves is s cave in a single quite outstanding tree, which is even furnished. But there’re some more, just look out! Another element of Daydream are Cica’s cats (well know from her installation 50 cats, read here in this blog). Some of them roam around at Daydream and made me smile. Apropos smile, Daydream seems not to have a really strong message, it is a dream, a place to let your mind wander, to enjoy new and old elements of Cica’s work, it’s colourful, whimsical, and peaceful. I don’t want to forget that Cica herself immersed into Daydream disguised as a black cat. 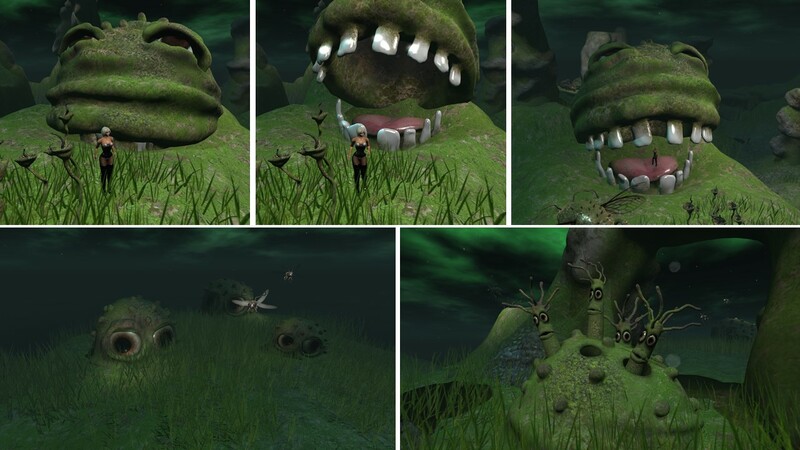 I found her close to the landing point and I assume that she’s sticks around there daydreaming when she’s online. Thank you, Cica for your newest installation. As always I enjoyed my visit and I really liked what I saw, so much to discover!